How can teens stay safe, especially in college? Teen dating violence help is available to anyone young person who is engaged in an abusive dating relationship. These teens should always get in touch with friends, family or the authorities for assistance. Many college campuses have free professional counseling available to help young students devise a plan. Teens can recognize being in an abusive relationship if they are prone to making negative changes to their lives. Young persons should also not give up on the hobbies or activities that they have always enjoyed doing. Instead, if you are worried about an unhealthy relationship, get even more involved in outside activities and clubs. Meeting new people and widening your circle of friends are sure-fire ways to broaden your support network and have teen dating violence help available when needed. Teens suffering in an abusive relationship should also be encouraged to explore other methods to empower themselves like joining a support group, taking the courage to call a crisis line or applying for a protection order. If you are unsure of what to do, start by meeting with you school or university's counselor immediately. In school, victims should endeavor to be with others rather than isolate themselves. It is also important to openly talk with friends regarding an abusive relationship so they are aware of what is going on and can provide support. Teachers, counselors and security personnel must also be informed so they can help keep you safe. To heighten your security in severe cases, you may employ some tactics like shifting your routine. Don't form a pattern of going home or arriving in school on a specific time day in and day out. If it can be arranged, seek another class schedule. Likewise, invest in a phone card or private cell phone to facilitate making calls. Knowing someone who is engaged in a violent relationship should bridle a sense of responsibility on your part. The first thing you can do is listen. Let your friend know that you are all ears anytime and make sure you do not interrupt or pass judgment. Next to listening is believing. Believe in your friends' stories and convince them that the abuse is not their fault. 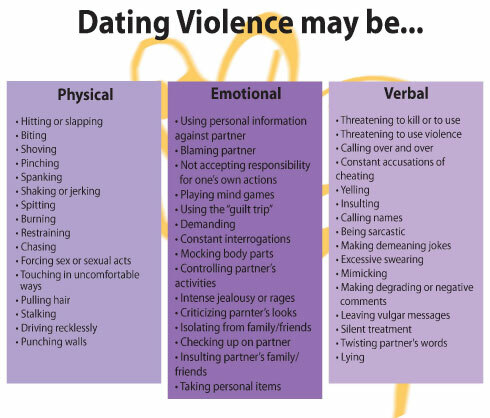 Keep yourself abreast of the warning indications of dating violence so that you can best help your friend recognize the abuse. Lead your friend to realize that his or her experiences are no longer normal and acceptable. Build up your friend by dissuading them from the relationship but avoid passing judgment upon them should they decide to stay. Likewise, it is important not to ruin your friend's trust by keeping your conversations private and confidential until seeking help from an adult or other authority. If you feel sure that you are indeed engaged in an abusive dating relationship, then it is time to take the first big step -ensure your safety and get domestic violence help. Do not hesitate to confide to a friend or a trusted adult. In case of physical violence, call the police right away or call for an ambulance so you can seek medical attention. Teen domestic violence is a serious and dangerous matter. Never isolate yourself from your friends, neighbors and your family. Endeavor to consistently keep in touch. Authorities like counselors, teachers, coaches, and friends are willing to help you. It is not wise to rely only on yourself in getting out of the situation. Remember that seeking help is not a form of weakness. Rather, it must be viewed as something courageous on your part for taking the first big step towards your liberation. If you will only take the time to surf the net or explore ways of getting help, you will realize that there is a community of people out there, either virtual or not, who are willing to take you out of your situation. Scan your local phone book for crisis centers, hotlines and other important numbers. These organizations have professionally trained personnel to listen, understand, and help. If you are unable to find local help, call the National Hotline. These trained professionals will refer you to resources that can support you and find help. The LoveIsRespect website has help for understanding the basics of dating and recognizing dating abuse. Communication with people who will help is available by live chat, SMS text messaging, or telephone. LoveIs offers live webinars and blog events talking about dating and relationships for teens. Click below to see contributions from other visitors who have submitted their own stories of domestic violence while in college.